A very slightly revised version appears as Chapter 6 of "Anarchist Portraits" by Paul Avrich, Princeton University Press, 1988. "The guard is tired." With these words, uttered on the night of January 5, 1918, a young anarchist sailor named Anatoli Zhelezniakov dispersed the Constituent Assembly and carved a niche for himself in the history of the Russian Revolution. When the tsarist regime collapsed in February 1917, Zhelezniakov, a disciple of Kropotkin and Bakunin, had been serving on a minelayer based in Kronstadt, the famous headquarters of the Baltic Fleet near the capital city of Petrograd. After the February Revolution, anarchists and other militants occupied the villa of P.P. Durnovo, the Governor of Moscow during the revolution of 1905, and converted it into a revolutionary commune and a "house of rest," with rooms for reading and discussion and a garden as a playground for their children. To hostile minds, however, the Durnovo villa had become a foul den of iniquity, "a sort of Brocken, where the powers of evil assembled, witches' Sabbaths were held, and there were orgies, plots, dark and sinister, and doubtless bloody doings," as N.N. Sukhanov wrote in his notes on the Russian Revolution. Yet the villa was left undisturbed until June 5, 1917, when a number of its anarchist occupants tried to seize the printing plant of a middle-class newspaper. The First Congress of Soviets, then in session in the capital, denounced the raiders as "criminals who call themselves anarchists," and on June 7, P.N. Pereverzev, the Minister of Justice in the Provisional Government ordered the anarchists to evacuate the house immediately. The next day fifty sailors, Zhelezniakov among them, rushed from Kronstadt to defend their fellow revolutionaries, who had meanwhile barricaded themselves in the villa against a government attack. For the next two weeks the anarchists remained entrenched in the villa in defiance of both the Provisional Government and the Petrograd Soviet. But after some of them broke into a nearby jail and liberated the inmates, Minister Pereverzev ordered a raid on the house, during which an anarchist workman was killed and Zhelezniakov was taken captive, relieved of four bombs, and locked up in the barracks of the Preobrazhensky Regiment. After a summary trial the government sentenced him to 14 years at hard labour and ignored all petitions from the Baltic sailors for his release. One day a group of sailors came to the Tauride Palace to see Pereverzev in person. Finding him absent, they seized the Minister of Agriculture, Victor Chernov, the Socialist Revolutionary leader and future chairman of the Constituent Assembly to whom Zhelezniakov, some six months later, would address his order to disperse; and it was only an impromptu speech by Trotsky, who (in a phrase that was to become famous) praised the Kronstadt sailors as "the pride and glory of the Revolution," that saved Chernov from being lynched. A few weeks later, Zhelezniakov escaped from his "republican prison" as one anarchist journal called it, and resumed his revolutionary activities. In a dramatic episode, he organised a mass demonstration of Kronstadt sailors at the American embassy to protest against the death sentence imposed on Tom Mooney in San Francisco, as well as the threatened extradition to California of Alexander Berkman, whom the authorities sought to implicate, with the same perjured evidence used against Mooney, in the Preparedness Parade bombing of July 22, 1916. In October 1917 Zhelezniakov co-operated whole-heartedly with the Bolsheviks in the overthrow of the Provisional Government. Although the crew of his minelayer elected him as their delegate to the Second Congress of Soviets, which met on October 25, 1917, he was busy that night leading a contingent of sailors in the storming of the Winter Palace that overthrew the Provisional Government. After the October Revolution Zhelezniakov was named as commander of the detachment guarding the Tauride Palace - "bandoleers of cartridges draped coquettishly across their shoulders and grenades hanging obtrusively from their belts", in the description of an eyewitness; and it was in this capacity that he carried out (on Bolshevik orders) his historic mission of dispersing the Constituent Assembly, ending its life of a single day. It seems fitting that an anarchist should have played this role. For the anarchists, as opponents of all government, rejected representative democracy almost as vehemently as they rejected the tsarist and proletarian dictatorships. Universal suffrage was counterrevolution, as Proudhon had said, and parliament was a nest of fraud and compromise, an instrument of the upper and middle classes to dominate the workers and peasants. With few exceptions (Kropotkin among them) the anarchists scorned what they called the "parliamentary fetishism" of the other revolutionary groups and openly denounced the Constituent Assembly from the first. During the Civil War that followed, Zhelezniakov fought in the Red Army as commander of a flotilla and later of an armoured train. He took part in crucial campaigns against the Don Cossacks led by Ataman Kaledin and against Generals Krasnov and Denikin. When Trotsky reorganised the Red Army, putting tsarist officers in positions of high authority and abolishing the system of self-government among the rank and file, Zhelezniakov protested vigorously, as did many other revolutionaries who opposed the return to old military methods. For this the Bolsheviks outlawed him, as they outlawed the Black Guards in Moscow and Makhno in the Ukraine. Zhelezniakov, however, returned to Moscow illegally and discussed the matter with Sverdlov, chairman of the Soviet Executive Committee, who assured him that there had been a misunderstanding and offered him a high military position. Zhelezniakov declined and left for Odessa, where he resumed his activities against the Whites. But he was too effective a warrior to be let go so easily, and the following year, 1919, the Bolsheviks repeated their overtures. This time Zhelezniakov accepted, and he was appointed as commander of the of the armoured train campaign against Denikin, who placed a reward of 400,000 rubles on his head. Zhelezniakov fought bravely without injury until July 26, 1919, when he was killed near Ekaterinoslav by a shell of Denikin's artillery. He was 24 years old. The Soviet government, though it had outlawed Zhelezniakov and declared him a traitor, now embraced him as one of its heroes. His body was brought to Moscow and buried with speeches and pomp. A statue of Zhelezniakov stands today in the city of Kronstadt - erected by the Bolsheviks in tribute to his role in the October Revolution and the Civil war. 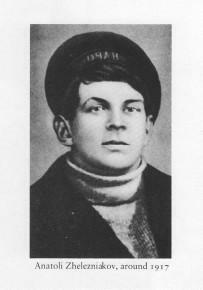 Poems and songs by Soviet writers have been composed in his honour and are recited and sung to this day ("beneath the earth, overgrown with weeds, lies the sailor Zhelezniakov, partisan"), but without any hint that Zhelezniakov was an anarchist. On the contrary, the Communists claim him as one of their own and avoid mentioning his anarchist affiliations by calling him a "revolutionary", a "hero," and a "martyr for the people." Soviet sources, in fact, say that he joined the Bolshevik party, but this is untrue. Though he had participated in the October Revolution and he had fought in the Red Army, Zhelezniakov remained an anarchist to the last. As he told his comrade Volin: "Whatever may happen to me, and whatever they may say of me, know well that I am an anarchist, that I fight as one, and that whatever my fate, I will die an anarchist." For all his revolutionary zealotry, Zhelezniakov had a gentler side. Hot-headed, militant, impulsive, he was also literate, idealistic, even aesthetic. During the summer of 1917, while imprisoned by the Provisional Government after the Durnovo villa affair, he wrote a remarkable poem, the only one of his that survives. First published in 1923 in the journal Krasny Flot (Red Fleet), it was reprinted in the 1970 edition of the annual Soviet literary anthology Den' poezii (Poetry Day). It is a moving poem, of which my unrhymed literal translation can only give a hint. 1. N. N. Sukhanov, The Russian Revolution, 1917, tr. and ed. Joel Carmichael (New York, 1955), p. 3o6. 2. Izvestiia Petrogradskogo Soveta, June 9, 1917. 3. Sukhanov, The Russian Revolution, p. 446. 4. Golos Anarkhii (Saratov), September 21, 1917. 5. Bulletin of the Relief Fund of the International Working Men's Association for Anarchists and Anarcho-Syndicalists Imprisoned or Exiled in Russia (edited by Alexander Berkman), March 1927. 6. I. E. Amurskii, Matros Zhelezniakov, (Moscow, 1968), pp. 121-27, Norman Saul, Sailors in Revolt: The Russian Baltic Fleet in 1917 (Lawrence, Kans., 1978), pp. 176, 188-89. 7. I. N. Steinberg, quoted in John Keep, The Russian Revolution: A Study in Mass Mobility (New York, 1976), p. 319. 8. Goneniia na anarkhism v Sovetskoi Rossii, ed. Volin et al. (Berlin, 1922), p. 53. 9. "Lezhit pod kurganom, zarosshim bur'ianom, matros Zhelezniak, partizan" (Mikhail Golodnoi). 10. Volin, The Unknown Revolution, 1917-1921, rev. ed. (Detroit and Chicago, 1974), p. 238. Emphasis in original. 11. Den' poezii (Leningrad, 197o), pp. 30-31. He had an older brother who was an anarchist too, but not so prepared to work so closely with the Bolsheviks. Only just read this biography.